Map of the Sky Album reviews. 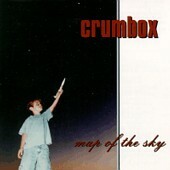 The last line of this album sums up Crumbox's Map of the Sky : "This is not a punk rock song." So what is it? To be frank, it is nothing you haven't heard before - your average alternative rock band. Included on the album are plenty of power-pop tunes, focusing on the inner lamentations of the world and its current state. "Gravity Girl," an uptempo piece about the problems of overcrowding and the desire to defy gravity and leave this world, opens the album. The rest of the album continues this trend of inquisitive, yet commonplace lyrics. While their sound is nothing new or extraordinary, it is catchy. The production was done by Caleb Southern, the producer of both Ben Folds Five albums, as well as Ben's solo project, Fear of Pop. Southern's influences are readily apparent on the album, giving it a feel similar to previous Ben Folds Five work, but the final product is closer to Harvey Danger's "Where Have all the Merrymakers Gone?" On the surface, this album may appear to be a failed attempt at a pop album. This is not the case. If you are looking to find a band to replace your Harvey Danger, pick this up - they were even so polite as to change Harvey Danger's hook "Paranoia, paranoia everybody's coming to get me." to "Underrated, overage and everyone's afraid to accept me."